Oral cavity cancer and oropharyngeal cancer are diseases in which malignant (cancer) cells form in the mouth or throat. Most oral cavity and oropharyngeal cancers start in squamous cells (thin, flat cells) that line the oral cavity and oropharynx. Cancer that forms in squamous cells is called squamous cell carcinoma. The back third of the tongue. The soft palate (the back, soft part of the roof of the mouth). Leukoplakia (an abnormal white patch of cells). Erythroplakia (an abnormal red patch of cells). Erythroplasia (an abnormal red growth). These lesions may become cancer but this does not happen often. Men are more than twice as likely as women to have oral cavity cancer or oropharyngeal cancer and die from it. Oral cavity cancer and oropharyngeal cancer are two different diseases, but they have some risk factors in common. Using tobacco is the most common cause of oral cavity cancer and oropharyngeal cancer. The risk of these cancers is about 5 to 10 times higher for current smokers than for people who have never smoked. 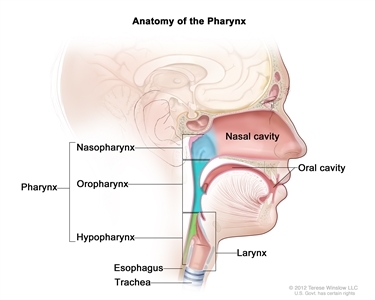 The use of all types of tobacco, including cigarettes, pipes, cigars, and smokeless tobacco (snuff and chewing tobacco) can cause cancer of the oral cavity and oropharynx. For cigarette smokers, the risk of oral cavity cancer and oropharyngeal cancer increases with the number of cigarettes smoked per day. Using alcohol is also an important risk factor for oral cavity cancer and oropharyngeal cancer. The risk of oral cavity cancer and oropharyngeal cancer increases with the number of alcoholic drinks consumed per day. The risk of oral cavity cancer and oropharyngeal cancer is about twice as high in people who have 3 to 4 alcoholic drinks per day and 5 times higher in people who have 5 or more alcoholic drinks per day compared with those who don't drink alcohol. The risk of oral cavity cancer and oropharyngeal cancer is 2 to 3 times higher in people who use both tobacco and alcohol than it is in people who use only tobacco or only alcohol. The risk of oral cavity cancer and oropharyngeal cancer is about 35 times higher in people who smoke 2 or more packs of cigarettes per day and have more than 4 alcoholic drinks per day than it is in people who have never smoked cigarettes or consumed alcohol. Chewing betel quid or gutka (betel quid mixed with tobacco) has been shown to increase the risk of oral cavity cancer and oropharyngeal cancer. Betel quid contains areca nut, which is a cancer-causing substance. The risk of oral cavity cancer and oropharyngeal cancer increases with how long and how often betel quid or gutka are chewed. The risk for oral cavity cancer and oropharyngeal cancer is higher when chewing gutka than when chewing betel quid alone. Betel quid and gutka chewing is common in many countries in South Asia and Southeast Asia, including China and India. A personal history of head and neck cancer increases the risk of oral cavity cancer and oropharyngeal cancer. Being infected with certain types of HPV, especially HPV type 16, increases the risk of oropharyngeal cancer. HPV infection is spread mainly through sexual contact. Studies have shown that when people stop smoking cigarettes, their risk of oral cavity cancer and oropharyngeal cancer decreases by one half (50%) within 5 years. Within 20 years of quitting, their risk of oral cavity cancer and oropharyngeal cancer is the same as for a person who never smoked cigarettes. It is not clear whether avoiding certain risk factors will decrease the risk of oral cavity cancer or oropharyngeal cancer. It has not been proven that stopping alcohol use will decrease the risk of oral cavity cancer or oropharyngeal cancer. Getting an HPV vaccination greatly lessens the risk of oral HPV infection. It is not yet known whether getting an HPV vaccination at any age will decrease the risk of oropharyngeal cancer from HPV infection. New ways to prevent oral cavity cancer and oropharyngeal cancer are being studied in clinical trials. Clinical trials are taking place in many parts of the country. Information about clinical trials can be found in the Clinical Trials section of the NCI website. Check NCI's list of cancer clinical trials for oral cavity cancer prevention trials and oropharyngeal cancer prevention trials that are now accepting patients. This PDQ cancer information summary has current information about oral cavity and oropharyngeal cancer prevention. It is meant to inform and help patients, families, and caregivers. It does not give formal guidelines or recommendations for making decisions about health care.